Your own private tropical paradise is a short walk to the beach, which is one of the most beautiful beaches in all of Hawaii. The beach is a white sand beauty with turquoise waters for your swimming and snorkeling enjoyment. The backdrop is majestic, emerald green mountains, with waterfalls and stunning mountain peaks. We are situated in Haena on the North shore of Kauai, which is surrounded by many spectacular beaches. You will enjoy exploring the natural locations in the area, which include sea caves, waterfalls, breathtaking scenery and endless white sand beaches. At the end of the road is the awesome Napali trail, which begins at Ke'e beach (a beautiful gem). Here you can begin your hike on the edge of the mountains along the Napali coastline where the tropical flora and fauna jungle blend into the multi-blue shades of the Pacific Ocean. This is first-class luxury with a down home feel! There are floor to ceiling sliding glass doors that open to a large covered outside porch with gorgeous views of the lush mountains and waterfalls. There is a large gourmet kitchen with stainless steel appliances and granite countertops, which include an Island with a cook top and a sit-down, glass surfboard-shaped eating table. Carved palm tree teak wood doors and teak cabinetry along with koa hardwood floors are combined with Bali imported stone features throughout house. Glass vessel sinks in bathrooms and glass tile are mixed with Bali river rock stone detail in the kitchen and baths, which create a modern tropical Hawaiian style beach house environment. The house is elevated for better views and a cooling trade wind airflow throughout the house. There are 17-foot high vaulted ceilings.The house has a large yard with numerous palms and tropical foliage set among landscaped sculptures. An outside bamboo shower with Bali stone floor greets you on your return from the beach, which is located a short stroll away. AWESOME time in this home. House was immaculate, well stocked, and very cozy. 6 adults fit comfortably. Felt very close to nature - like living in a rain forest with a wildlife sound track. Beautiful Tunnels Beach was a short 5 min walk away. Awesome vacation! This is our second time staying at this property. It is perfect for one family. We have small kids and the location could not be better. The outside Lani is also beautiful to spend time as it overlooks the garden. The house is very equipped with what you need and it’s always clean. We will be back. We spent two delightful weeks here. We loved being able to open the sliding glass doors to connect the lanai with the living room/kitchen. Katie was easy to deal with, and the home was even better than we expected. What a great home nestled in a wonderful area. If you are looking to get away from it all and re-charge your spirit this is the place. House is as good as advertised and the nearby beaches are wonderful. Could not have been happier with our visit. Great snorkeling and plenty of places to explore. We loved our stay. The house is very nice, easy to manage, a great spot for hanging out, even when the weather isn't perfect. Close to Tunnels Beach (an easy 3-4 minute walk), and quiet. Great views of the mountains. Kitchen is great for communal cooking. Everything was outstanding, and we highly recommend! 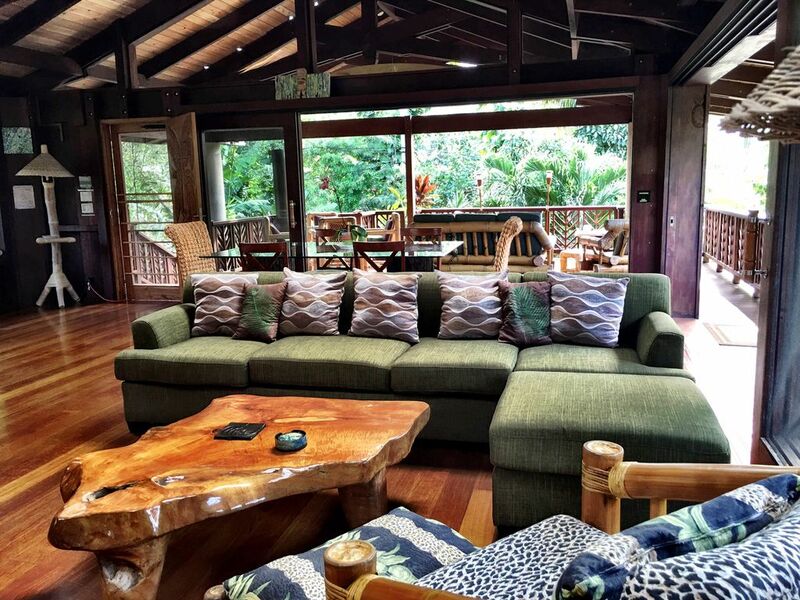 Tikihouse with amazing location .... you feel like you have your own private rainforest with feral chickens in the yard, wonderful open space and short walk to Tunnel Beach for amazing snorkeling! Short drive to Napali Coast Trail and to Hanalei. Accommodations perfect for 5 of us! Very special place! - 2019 REGULAR RATE ( January 4th to May 31st, September 7th to December 17th): $429/ night for 2 people plus $40 each additional guest - 2019 SUMMER RATE (June 1st to September 7th): $589/ night for 2 Guests and $40 each additional guest ADDITIONAL FEES: * Outclean and Maintenance Fee: $350-$450 (depending on the number of Guests staying) * Refundable Security Deposit : $300-500 per stay * Reservation Fee: $50 per stay *Reservations are not confirmed until deposit has been received or other verbal arrangements have been made. - Please inquire for exact rates as outclean fees, etc. are not included on price quotes generated by computer through the Homeaway/VRBO system.